None of them are incredibly noisy, but if you want a DVR in your bedroom, you’ll want the absolute quietest one. Really, the quietest box with full DVR functionality is a Genie Mini Client — they’re absolutely silent — but if you really want an actual DVR… how do they stack up? All DVRs have a hard drive and a fan, and both generate noise. In early DIRECTV DVRs the fans were on almost constantly, but increases in efficiency have made fans less and less important. Hard drives, on the other hand, are still a critical part of the process and DIRECTV selects their drives for durability and efficiency, not for silence. While it would be nice to have the option to test every recent model DVR in a soundproof room with a microphone, our blog’s budget won’t let us go there, so we’re left with the subjective impressions of people who’ve put DVRs in their bedrooms. Most think the sound isn’t a problem at all, but of those who have found the sound noticeable, here’s a rundown of all the modern DVRs, from loudest to softest. Note that each DVR model has multiple manufacturers (except for HR34 Genie) and you do expect some variations in sound due to that. The HR20 is easy to spot since it’s the only HD DVR with a silver case. It was the first member of the current line of 2-tuner DVRs and runs the hottest. This means two things: the fans are on almost all the time, and there’s a lot of venting at the top of this DVR. It lets sound out just as efficiently as it lets heat out. The bare metal-against-metal chassis also has a tendency to buzz or whine after the DVR’s been running for a while. Adding felt pads underneath the DVR does help with this, and sometimes it’s even necessary to shim a piece of paper between the top cover and the chassis. 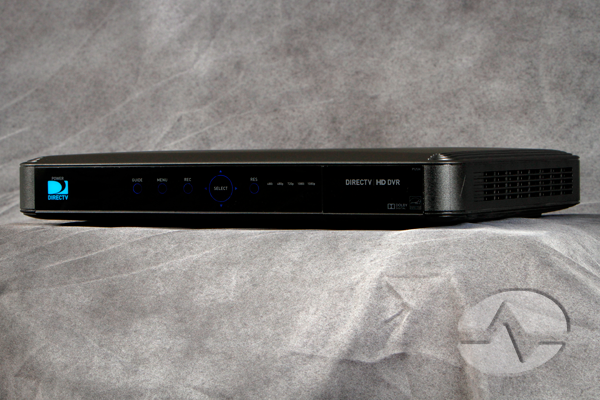 The DIRECTV HR34 Genie was the first 5-tuner DVR from DIRECTV and like the HR20 it has a lot of vents to control heat. It also boasts the largest fan of any DIRECTV DVR (not counting the rarely-seen HR21Pro) and the fan is mounted right at the edge of the chassis. This makes it fairly loud when running. It’s not a good choice at all for a bedroom, due not only to the noise but also to the overall size. This is easily the largest DVR DIRECTV’s made, and the largest one it is likely to make. It’s about the size of an ’80s VCR. It would be interesting to get these two DVRs in a room and really test which is loudest, but whichever one wins that battle doesn’t matter… these are two fairly loud boxes. DIRECTV took the HR20 design and streamlined it with second-generation components and a coat of black paint. The resulting HR21 DVR doesn’t need as much venting and the fan runs far less often. However, these DVRs are known for having a lot of hard drive noise. There are internal differences between the HR21, HR22, and HR23 DVRs but they don’t seem to really make a difference to noise levels. If you have one of these in your bedroom you’ll hear that drive clacking away all night. The HR24 is almost silent, save for just a little hard drive noise now and again. Its plastic case and minimal venting mean the fan noise really isn’t an issue. It’s hard to fault this DVR for its noise, because there is hardly any, and it’s small and slim; it could live happily behind a dresser. There’s hardly any sound at all from the HR44 Genie DVR. It has the smallest fan of any DIRECTV DVR, and it hardly ever goes on after the inital bootup. The box is designed for maximum heat dissipation with vented channels on the sides that take care of heat without letting noise out. The drive is well insulated from the outside world so you barely hear it in the middle of the night. It’s also DIRECTV’s smallest DVR to date, smaller than the 2-tuner HR24, which is certainly appreciated in a bedroom.